5 bedrooms, sleeps up to 12 with 5 bathrooms**Perfect Condition! table seating 18-20 with oversized Anderson sliding doors. -Table pads stored in hand made dining room buffet unit. Walk to our private community newly resurfaced tennis courts. Easy 5 minute walk to our private sandy bottom beach on the cleanest lake in the Berkshires, swimming, boating, canoeing and sailing area. Just minutes to Tanglewood, Jacob's Pillow, Norman Rockwell Museum, Lenox, Stockbridge, Great Barrington, golf courses & shopping. 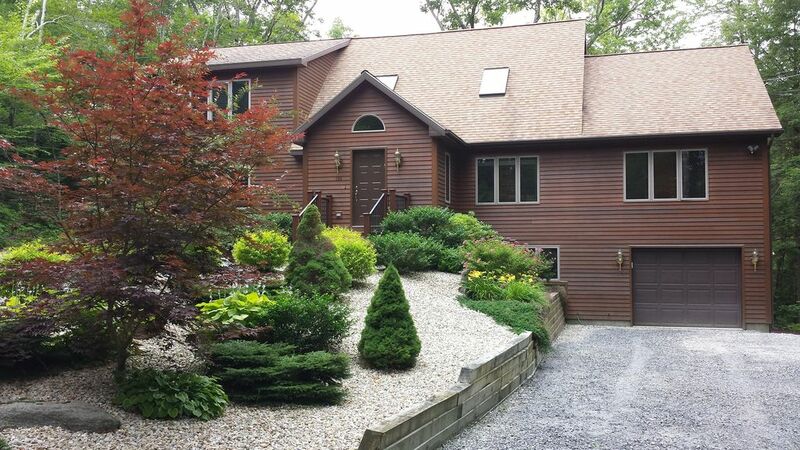 Close to ski areas and 7 minutes drive to the Big Y and friendly town of Lee. Newly Decorated & So Comfortable! Holidays are special rates as listed and you may chose how long you wish to stay. Property is available for an August full month rental @ $16,900 or for a two week period at $10,000. Bathroom Configuration: 3 full bathrooms including two oversized walk in showers plus an upstairs bathroom with a combination tub/shower. Also a half bathroom off the living room and an additional half bathroom for the finished basement close to laundry room as well as a sleeping area with a queen sized bed. Weber Grill, never runs out of propane--connected to 500 gallon tank. Easy parking with a Y shaped driveway. Comfortably fits one car, remote available along with key pad on outside of the door. Brand new huge dining room, comfortably seats 16 at one new custom built dining table. Large finished basement with Ping Pong table. 2 kings, 4 twins, 2 sleeper sofas (new technology - Lazy Boy queen-size). Stone fireplace; Weber gas BBQ grill. Swimming, biking, hiking, boating, tennis, beach, skiing, golfing, shopping, minutes to Tanglewood, Jacob's Pillow, Norman Rockwell Museum and just plain relaxing. Twenty minutes or less from Lenox, Great Barrington, Stockbridge, Pittsfield and only 7 minutes to downtown Lee.